But these leaflets — while completely different — were simply too boring and banal to be targetting. You can’t find who their audiences are. Hang on! I’ve already got one of these Election Communications! It arrived here over a week ago. It was the folded up booklet kind. I thought the parties get only one freepost Election Communication per candidate. (The rest have to be paid for by themselves or delivered by hand.) What are we doing with two? A candidate at a parliamentary election is entitled to send free of any charge for postage either (a) one unaddressed postal communication, containing matter relating to the election only and not exceeding 60 grammes in weight, to each place in the constituency which constitutes a delivery point for the purposes of this subsection; or (b) one such postal communication addressed to each elector. A few days ago, Becka invoked part (a), the unaddressed delivery, one per household. But if you have money, organization, masses of computers, and economies of scale, you can use invoke part (b) to get multiple effective mailings to each address according to the number of registered voters. Often these will be cohabiting couples who will no doubt share their Election Communications, basically doubling the number of leaflets obtained from this law. The Tories and LibDems seemed to have done it. But Labour have not. To leave evidence available, please mark your leaflets as “same address” and initial it if you redact it. One of the reasons I know slightly more than bugger all about election leaflets is that I have been drafted into participating in the process. Last week Becka handed over £500 for the deposit to stand as a candidate — and then she decided she wanted it back, which means she needs to score at least 5% of the vote. We don’t have time to deliver leaflets and canvass in the constituency because it’s not a target seat. The policy of all parties, especially the LibDems, is “Target to Win”. It’s the only tactic to use in the current electoral system. Nobody cares if you take a few thousand extra votes off a candidate in a safe seat. But if you get that last 150 to take the majority, that makes all the difference. * Facing the same way and the same way up. * Pre-sorted and bundled by individual postal delivery walk. * All bundled must be banded using elastic or paper bands. * All bundles must be presented in bags must be double and cross-banded, bundles presented in boxes can be single banded. No way! Much too hard. All the Tory party blue A3 leaflets of the same form have been delivered this way, because they get the scale and have the databases. More realistically, there is an Unaddressed delivery option. Becka had to give 48 hours notice for the post office to approve the leaflet. The words “Election Communication” must appear on the face of it, and it must relate to the election (so you can’t use this service as a cheap way to deliver commercial junk mail). 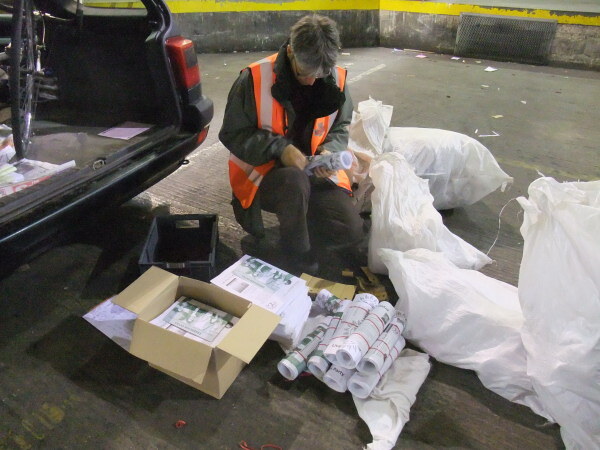 Then she spent all Saturday running the risograph to make 10,000 leaflets (while I was down in London at OKCon). 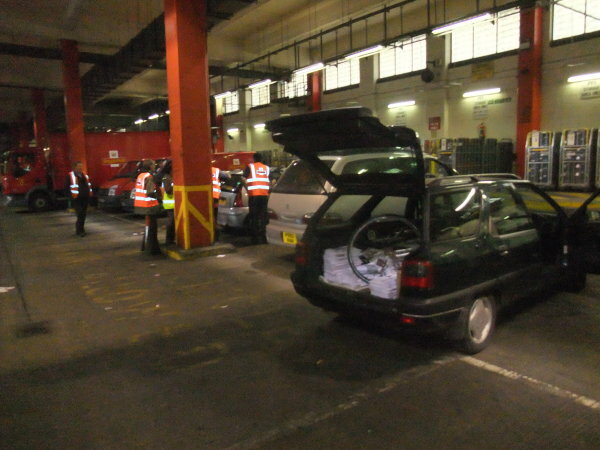 We fetched them by car into the sorting office on Monday morning. One of the piles of leaflets in the back of the car fell over as we turned the first corner. Bundling into 100s? Putting into 11kg boxes? Did someone actually read the instructions? A very nice lady in the sorting office found us a crate of rubber bands to make amends, as well as some post office bags to put them into. The other parties meanwhile made their deliveries of masses and masses of properly labeled and sorted boxes like real pros. I await evidence from TheStraightChoice if any of these deliveries have gotten through. You know, this is probably something useful for other parties who want to know if their leaflets are getting through. Where do your candidates live? If you go into the polling booth at this election you will find that for the first time since the Ballot Act 1872 some of the candidates have decided to keep their addresses secret. Well, according to the Electoral Commission’s paperwork, all a candidate needs to do is tick a box on the Home address form and only the name of the constituency where they live will be disclosed. There was a consultation over the change (which I entirely missed), and a 9 page Parliamentary briefing paper. Messing with electoral law is a serious matter, especially when it is done on a whim on the basis of no evidence by those who are seeking re-election in a “turkeys voting against Christmas” scenario. You might think this amendment is trivial, but all across the country elections are being fought explicitly over who is the more local candidate. And in other democracies, such as the United States, residency requirements are written into the Constitution. Add to that the expenses scandal where MPs were permitted to lie about which was their second home, and flip them for profit. So the issue is not really a trivial matter to us, the electorate, even though MPs profess not to know why we would ever need to know where they live in enough detail to verify that statements they make about themselves are honest. None of these arguments appeared in the consultation document. (1) Candidates, and those elected as MPs, may be discouraged from speaking freely on issues if they fear that they may be subject to harassment or interference or worse. (2) They may also fear that their families could also be at risk from disturbed or fixated individuals who may track them down at home. (3) We understand that MPs have experienced examples of such disturbance and harassment. Of course, if someone who is targeting a particular MP and means to track him or her down in order to do him or her harm puts in enough effort, it will be possible to do so. [The Government] received 65 responses to the consultation. The majority of the politicians who responded and the Electoral Commission favoured a change to the current position whilst electoral administrators, returning officers and the majority of the responses received from members of the public have confirmed their preference for retaining the status quo. Why did this come about? Let’s check the record. The story begins with the MPs’ expenses scandal. The Information Commissioner had ruled that MPs’ addresses were to be disclosed in the public interest, in controvention to the usual guidelines of the Freedom of Information Act, probably because he knew they had something to hide — which they did. The emergency The Freedom of Information (Parliament and National Assembly for Wales) Order 2008 was debated in Parliament on 17 July 2008 to put a stop to that. The following year the paranoid Julian Lewis inserted a new clause to the Political Parties and Election Bill (because it was “at odds” with the changes to the FOI legislation) by a vote among MPs, and the job was done. I have blogged about this here, here and here. I don’t particularly like Julian Lewis, and his arguments about the security of MPs are extremely flawed and irrational. It is deeply unfortunate that a mind such as his has such an influence on this country’s Cold War-ready nuclear weapons policy, and other defence and terrorism related issues, being as he is now the shadow defence minister. Paranoid nutjobs who won’t disclose their home address to the voters shouldn’t be standing for Parliament. If they can’t take the heat, go and get another job, like lobbying for BAe, and leave the place open for real representatives of the people. Sometimes there are leaflets that just take my breath away. There are the execreble ones, like Roger Godsiff’s attack on his opponent’s party for having the temerity of suggesting we abide by a 2005 European Court ruling that we stop routinely stripping voting rights from all people in prison without the say-so of a judge. 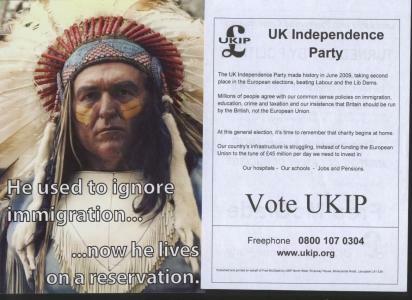 But this one, with the native american behind the slogan: “He used to ignore immigration; now he lives on a reservation”, is a stroke of utter genius. 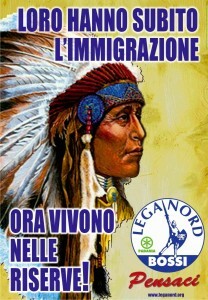 You get there by imagining this poster being used in other anti-immigration contexts, such as in America, where there is quite a movement of white guys who want to close the border to Mexico to stop all the immigrants coming in and flooding “their” country. But it was us, white guys, who pushed those native americans into the reservations. We’re the bad guys in the story. Don’t you get it? I have a fantasy of some group of red-necks in America seeing this poster and getting the initial story, but not thinking it through (what’s new? ), and printing lots of posters of it to take on their next rally. No one will know what to think. It’s much more interesting than pictures of Hitler. You know he is a bad guy. But a native american. Is he a good guy or a bad guy? The story is a Necker cube. Update: Some quick checking on-line searching traces this particular idea to the right wing Northern League in Italy in their 2008 elections. (link) Even though they don’t have a StraightChoice.org, their posters are available on their website. The funny thing is I always thought that italians were better dressed than that baggy green sweater guy. If I’m going to go on about how Parliamentary Candidates ought to do some homework about what goes in the our Victorian era legislative process by doing some motion text editing, so they don’t spend their first two years in a state of complete bafflement, following through the lobbies like lambs until there’s finally an issue they fully understand and they can use that understanding to unpick all the procedural choss that’s going on, I might as well do some high profile editing myself to show them how it’s done. A lot of people who watched the hosing through of the Digital Economy Bill last month couldn’t tell what was going on, even though the procedure was telescoped down into a matter of hours rather than weeks. Here’s what happened. The outline of the Digital Economy Bill passage is here. It began in the House of Lords, being piloted by Peter Mandelson. The first Lords vote was on the 6 January over extending the powers of OFCOM. It tool me one hour to piece it together from the changes it made to the Communications Act 2003. I got up at 6am because I wasn’t getting any sleep. (1) C4C must report on the duties under section 198A in their annual report. Done that. And the following one. It’s now 9:46am. It’s getting too hard. It looks like there’s one vote in the Commons on the Third Reading (edited by someone else), and then one in the Lords that is entirely incomprehsible. It’s lunch time and I haven’t done any work again. We have a problem if talking about the future sounds unrealistic. The future is here today as much as the past is. Those houses they’re putting up across the road should stand for 50 years. There are children born today who will live to see the end of this century. Seen on this scale, the result of this general election will be but a minor statistic. But what effects will it leave behind? Let me tell you about economics today. The people who make the most money out of it have the loudest voice. Remember the cabin crew strike from four weeks ago? There was an immense amount of coverage over a trivial pay dispute, breakdown in industrial relations, the profits of a favoured British corporation, the inconvenience of passengers who had to book tickets with other companies. The engineers who built the planes and the scientists who study the volcano say this is how it is. And we don’t expect them to invent a special metal coating that can be applied to jet engines to make them resistant to volcano dust. So when scientists say global warming will do this and this and this, and we need to do that and that and don’t expect us to invent some new technology no one knows about to make the problem go away, why don’t we take them at their word? Although this volcano began to be active last month, no one was predicting the later eruption on 14 April which caused all the disruption. If these hundreds of thousands of people stuck on the other side of the Channel knew this was going to happen, do you think most of them would have cancelled their tickets? Instead they’re waiting for the British navy to sail over and rescue them — if they can fit any passengers on-board between the multi-million pound Harrier jump jets and assault weaponry that don’t seem quite as useful as we imagined they were going to be. A little more concern for the future can go a long way. But at the moment you can make a lot of money by not predicting the future and not responding to it, because the economy is not fair. This pattern is across the board, but we can see it most obviously in the financial system where the very people who drove the system to a crisis point are now wealthier than ever before. It’s not fair. As long as it remains unfair, it will never get better. The ecological crises that are facing us are immensely powerful and predictable. If we do not respond to them appropriately, we will find ourselves in a place we never wanted to be. We need to think seriously about it. It’s not fair and it’s very dangerous that politicians who do not want to deal with it continue to have successful careers. Because if we get it wrong, it’s not going to be a matter of inconvenience of not being able to get home on time. There won’t be a place to get home to. 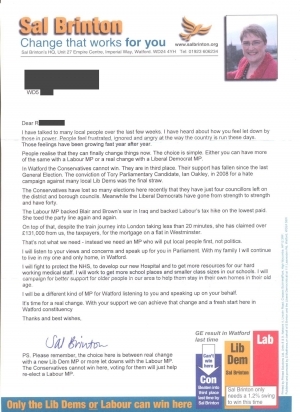 It’s over three weeks to the election and filth like this leaflet is already flying out the risographs of the local Labour party headquarters into the mailbags of willing smear merchants. Whatever it takes to win an election, eh, Mr. Watson? The style looks like one of yours. Maybe you’ve been running courses over the winter. When I am elected as your Member of Parliament I will make my home in Wavertree. 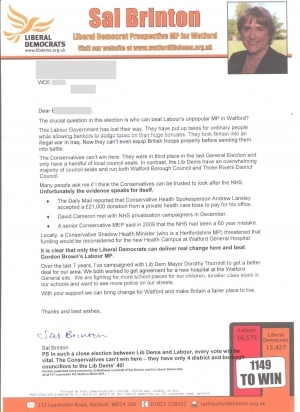 Of course, she’s not mentioned anywhere in this particular Labour attack leaflet, because it wouldn’t make sense to be slamming the LibDem candidate for moving here five years ago (and being committed enough to get onto the council), when your own candidate first heard of the constituency after she got allocated to it by the central party machine three months ago. But by putting this attack ad on a separate sheet of paper, no one is going to notice, are they? People are not always so stupid. But what they do have is a very short memory. Luckily, this short term memory problem can be cured with these recording devices called computers. Was it because the good people of Liverpool Wavertree actually liked these sorts of policies? No. The record will show that it happened because her party spread around leaflets in which the picture of other serious challenger in the race was stretched wide to make him appear fat and ugly. No one wants to vote for the ugly guy. They want to vote for someone who’s pretty. That’s why full colour glossy pictures of Luciana’s beautiful face will be on every election leaflet from now on — except these attack ones. Unfortunately, when she returns to London with our democratic mandate, it will be what is on her mind that matters. 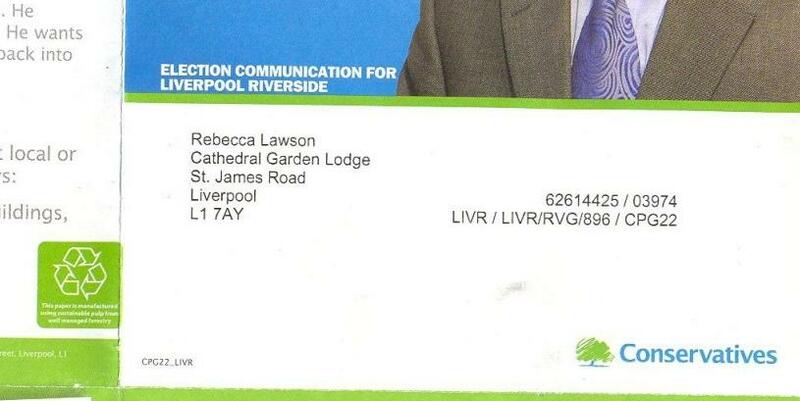 HOUSEHOLDS in the Wavertree area of Liverpool may have received political leaflets on behalf of the Labour Party which prominently features BBC Radio Merseyside’s phone-in host Roger Phillips. 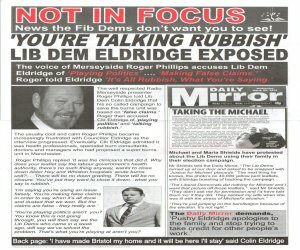 The leaflet selectively quotes from an interview which Roger did with the Liberal Democrat candidate for Wavertree Colin Eldridge last November along with headlines which imply he backs Labour’s stance. 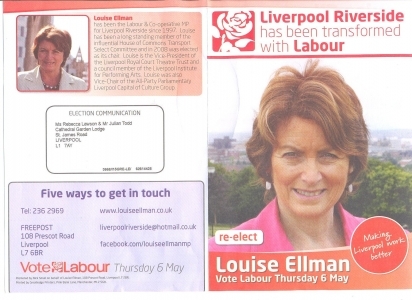 While I am not challenging the factual accuracy of the transcription, the quotations were taken out of context and the impression given by the prominence of the leaflet and the words chosen is that Roger, and by implication BBC Radio Merseyside, is in some way backing the Labour Party’s campaign against Colin Eldridge in the general election. While this is clearly not the case I am keen to distance us from any such assocation with the Labour Party, or indeed any political party ; the BBC’s editorial objectivity must remain intact at all times, particularly during such a crucial election period. The interview with Colin Eldridge was part of our daily dissection of the regular political scene conducted with Roger’s usual rigour and professionalism and applied to all candidates whatever their political viewpoint – and this will continue throughout the general election period and beyond. We did kayak dived the Runnel Stone the day before yesterday during the LUSAC easter trip (to take advantage of the boat cover). Who cares about an election when you have a chance to do that? A write-up of the week, which began with very grumpy weather, and then suddenly brightened up to scorchingly fine conditions will probably follow soon. In the meantime, here are some pics.